*Update* 2/20/2016 – Sadly, Cow Bessie’s health went downhill and she is no longer with us. Her sponsorship remains in spirit. Cow Bessie (view her PetFinder ad here) has lived her entire life in a kennel. Born at Better Days Animal League in 2009, Cow Bessie was overlooked by adopters over and over again throughout her years at Better Days Animal League. Cow Bessie adores attention from people and especially loves treats! In the fall of 2014, volunteers noticed Cow Bessie’s balance appeared to be off and noticed her stumbling while out on a walk (watch video of Cow Bessie). Numerous vet visits and treatment plans came up short. What was initially thought to be an inner ear infection appears to be a neurological issue. Cow Bessie was referred to a neurological specialist who was unable to diagnose her condition. Cow Bessie remains happy and the veterinarian’s agreed that it was likely better to manage condition rather than continue to put her through costly procedures, such as the next step of an MRI, to determine the root of her issue. Cow Bessie remains on medication for life to manage her condition and while she occasionally stumbles and falls, this girl remains happy. Our volunteers do everything possible to ensure Cow Bessie’s health and happiness as she continues to live out her life in a kennel. 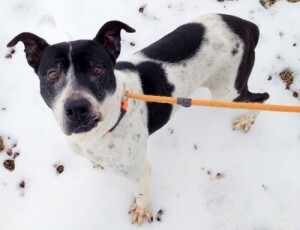 Cow Bessie needs your support to make sure Better Days Animal League can continue this care. Please consider supporting Cow Bessie today! Even more, Cow Bessie would love a home! She is certainly adoptable to the right home environment and nothing would be better than to see her out of a kennel! She adores people but enjoys their company much more than other dogs so a single pet home would be ideal. Loud noises scare Cow Bessie so a calm, quiet home would be best for her. She enjoys going for a walk, loves treats and enjoys chewing on toys. 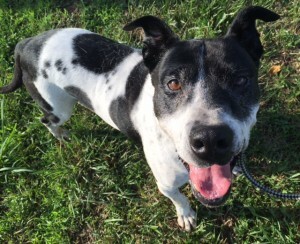 If you could support an older girl with a few special needs, Cow Bessie may be the one for you!